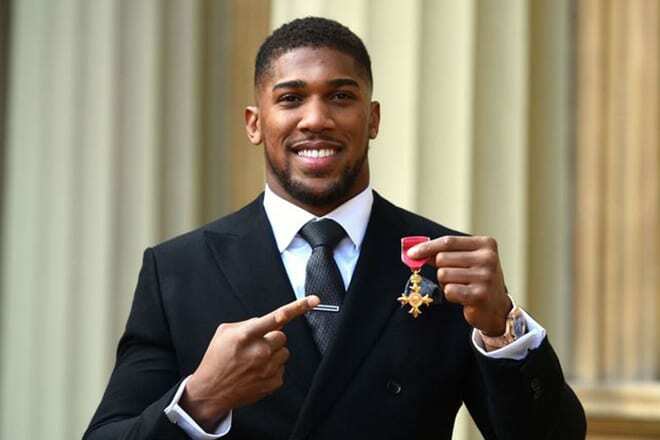 Anthony Joshua OBE – The world heavyweight champion has been rewarded with another Queen’s honour for his work in the boxing ring. The WBA, WBO and IBF title holder was rewarded with an OBE by Prince Charles at Buckingham Palace for his services to sport, having breathed new life into the world of boxing since turning professional. Joshua was previously given an MBE in 2013 after winning a gold medal at the 2012 London Olympics. He began life as a professional boxer with 20-straight knockout victories, adding the 21st via a unanimous points decision against Joseph Parker during their unification bout back in June 2018, which saw the former boxer add the WBO title to his trophy cabinet. When Joshua knocked out Wladimir Klitschko in-front of a sold out Wembley arena in April 2017 in the 11th round, it was heralded as a breakout moment, cementing his position atop of the heavyweight decision. Whilst that fight with Klitschko remains the stand-out moment of his career, although, the best may be yet to come. Deontay Wilder, holder of the last remaining belt needed to unify the decision, recently retained his WBC title after drawing with Tyson Fury in what many consider to be a controversial decision, a result which points toward a second bout between the pair at some point next year. If Wilder and Fury do fight again, Anthony Joshua’s quest to unify the heavyweight decision may take a little while longer. On Saturday 22 December 2018, Dillian Whyte will fight Dereck Chisora at the 02 Arena, with Joshua said to have a keen interest in that bout, as the winner could serve as his next opponent. If Whyte wins, it has been suggested that AJ will fight him for a second time at Wembley Stadium on April 2013, following on from his victory at the end of 2015. American boxer Jarrell Miller recently called out the Olympic champion and represents another potential opponent for Joshua heading into 2019, although promoter Eddie Hearn maintains that securing a unification bout for Anthony Joshua OBE with Deontay Wilder for the WBC belt is remains a priority.